The personal journals of Lealea's First Mate. 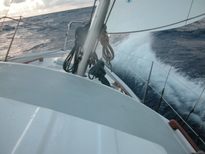 Lessons learned and reflections on life aboard a 27' cruising sailboat during her voyages. Our first long voyage in Lealea. 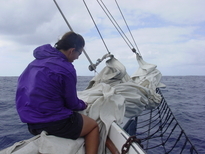 In 2007 we sailed from Honolulu to Neah Bay, WA. It took us 55 days due to some unforseen circumstances but we learned a lot on this trip and it was all good. In 2011 we sailed Lealea from San Francisco to Kawaihae, Hawaii. This exciting trip took us 38 days and we continue to learn valuable lessons. making the transit from Nawiliwili, Kauai in the Hawaiian Islands to Sitka, Alaska on Baranof Island, we sailed through the infamous "Garbage Patch" in the North Pacific documenting tsunami debris along the way. Our first overnight passage aboard Lealea. The twelve hour trip to Nawiliwili Harbor was filled with learning curves. We had a great time although we did not quite manage to make it home in time for work Monday morning. The E-mail from Nawiliwili Yacht Club. stated “another sea miles opportunity” had just developed on a 70 foot wooden schooner named SPIKE AFRICA. I made the call and within a few days stepped off the plane in San Diego to act as delivery crew. This link leads to a PDF file.